Edmunds.com is a leading online car information and shopping marketplace serving nearly 20 million visitors each month to their website. 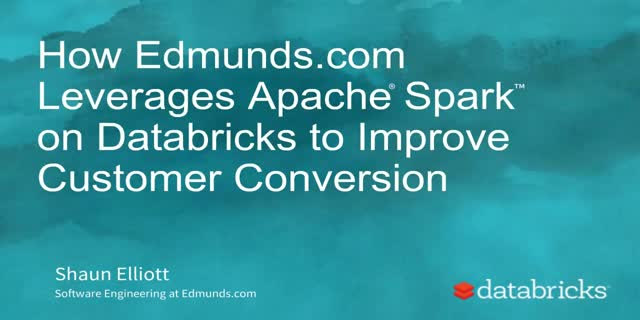 With a 10x growth in data to 100x of TBs in the past for years, their engineering team was looking for ways to increase consumer engagement and conversion by improving the data integrity of Edmunds' website. Databricks simplifies the management of their Apache Spark infrastructure while accelerating data exploration at scale. Now they can quickly analyze large datasets to determine the best sources for car data on their website. Why Edmunds.com moved from MapReduce to Databricks for ad hoc data exploration. How Databricks democratized data access across teams to improve decision making and feature innovation. Best practices for doing ETL and building a robust data pipeline with Databricks.